How to fix iPhone 8 failing turned on Problem? these days, We received an iPhone 8 from the customer. He told us that his iphone suddenly couldn’t be turned on. We connected the iphone 8 to the DC Power supply and found that the current is 250mA when the iphone 8 turned on, then goes back to 0 and continues to cycle. Based on past repair experience, we judged that it is related to the USB charging part. The way to disassemble iphone 8 is similar to the 7th generation. 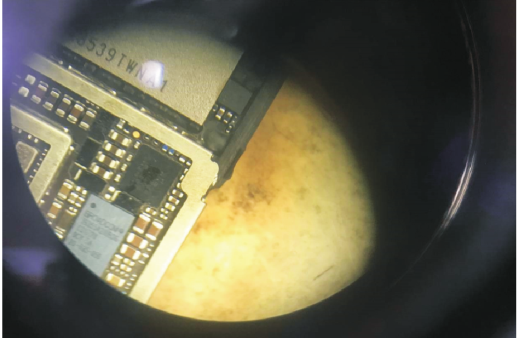 Using thedigital desoldering station to disassemble the motherboard, we found that the counterparts have soldered the charging part, while the 8th generation U2 (6300) is still located at the bottom right of the NAND flash, which is not common with previous models. Remove the U2 with desoldering tool, and use Fluke digital multimeter to measure the pad resistance, there is no any abnormality. when the machine powered-on, the current is also normal without U2. Replace the new iphone U2 chip and test machine, we found that iphone can enter the system. And then insert the charger, iphone can not trigger the boot, and can not charge too. After we replaced the iphone 8 tail plug flexible cable , the problem still existed. Then we measured that the 5V power supply from the charger, which was different from that of the previous generation. There is no Q protection tube, and the tail plug is directly sent to the U3300 charging tube. We use the digital multimeter measure the voltage has been sent to C3301. Is it because the faulty charging tube resulted in no voltage output? We have to remove the U3300 charging tube and measure the foot with normal resistance. The U3300 chip is also different from previous models. Replace the new iphone 8 IC and test the current have recovered normal when power-on. There is a voltage of 4.2V on the electronic carrier, and the retesting machine is restored to normal. The fault that this iphone 8 can not boot is caused by the charging part. When we encounter an iphone with a charging fault, we could eliminate the external distribution at first and then test the line to judge the cause of the fault.